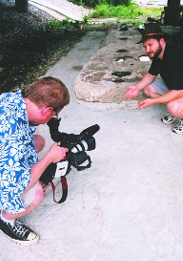 On any given night, most television viewers across the United States can find a documentary that encompasses some aspect of geology. The program of choice could be a Science Channel show on volcano chasers, a Discovery Channel show about the last Ice Age in North America or a National Geographic Channel piece on asteroid impacts on Earth. If viewers want a dose of science in their primetime viewing, these hour-long programs are about the only choices. Viewers in North Texas and the San Francisco Bay Area, however, have another option: local geology on local television stations. Todd Kent shoots Devin Dennie discussing local geology for an upcoming episode of GeoAmerica. Image courtesy of Wayne Newman. North Texas Explorer and Down to Earth are two half-hour-long television programs that explore the geology of Texas and California, respectively. The geologist-producers of both shows began their field-trip-style programs to entertain and educate the general public  to bring geology into peoples homes and show them that geology is fun. We looked around and wondered, why isnt there a recurrent field-trip-style earth science and history show on TV? says Devin Dennie, a geologist from Texas who is currently in a Ph.D. program at the University of Oklahoma, and producer and star of North Texas Explorer. We felt there was a niche for this, teaching the general public how geology affects our everyday lives, he says. So a few years ago, when Dennie was in a geology masters program, he and his childhood friend, Todd Kent (who was finishing up a degree in television and video production), got together to create the show. At first, doing the show was a hobby. But the more we did it, the more we realized that people were watching it and actually liking it  it was filling a need in the community. So he and Kent decided to step it up a bit after graduation. They teamed up with friend and photographer Wayne Newman and found a professional media company to help produce the show so they could reach a larger audience, but they still do most of the work themselves, including the scriptwriting, on-camera hosting and narration, filming and editing. North Texas Explorer has been seen on 10 stations across northern Texas and New Mexico. The producers are now taking on a more national scope in the form of a new program called GeoAmerica  a travel show that focuses on earth science heritage across the country. They have already shot several episodes and are hoping to produce more once funding is secured. Our goal is to broadcast this nationally and to eventually cover all 50 states, Dennie says. For geologists Mel Zucker and Richard Lambert in California, Down to Earth also started as a hobby. The two are geology professors at Skyline College, a community college in San Bruno, Calif., in the Bay Area. They wanted better images and educational material for their geology classes, Zucker says, so we started making our own. They began doing multimedia presentations in class in the 1970s, Lambert says. We used to set up six or eight slide projectors and show all kinds of slides, as if we were on a field trip, he says. As technology advanced and became more readily available, the two moved into the video realm. The professors now use the 30-minute programs in their classes as well as showing them on two cable-access channels in the Bay Area. 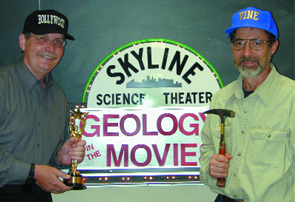 In San Francisco, geologists Richard Hollywood Lambert and Mel Vine Zucker review geology in the movies for their award-winning public access television series Down to Earth. Image courtesy of Pat Carter, Skyline College. Through the show, Zucker and Lambert have educated and entertained the public and their students about topics near and dear to Californians: gold mining, marine biology, coastal erosion, and of course, plate tectonics and seismology. They have collaborated with and interviewed a number of geologists at the U.S. Geological Survey (USGS) in Menlo Park, as well as geologists and engineers from across the country. Lambert and Zucker say that their students seem to like the movie review episodes best. In the reviews, the geologists, in a parody of national movie review shows, sit in director chairs and explain how the moviemakers got it right or blew it completely, Zucker says. They have covered The Core and Dantes Peak, among others. The team has produced more than 45 shows so far, with more in the works, such as a four-part series commemorating the centennial of the 1906 earthquake in San Francisco. The 1906 temblor, Lambert says, marked the beginning of modern seismology. Its important for people to understand the history and the science of it, he says. Zucker and Lambert are providing a tremendous service to the community and really ought to be applauded, says Mary Lou Zoback, a seismologist at USGS in Menlo Park who has been interviewed for the 1906 series. Working with the two has been great, she says, as they ask excellent questions and then skillfully extract the parts of what we discussed to produce a very professional show. This type of program is absolutely something that should be done elsewhere, Zoback says. Gorgon is short for gorgonopsian, a lion-sized reptilian predator of the Late Permian, known primarily from fossils found in the Karoo basin of South Africa. The book Gorgon is an autobiographical account of Peter Wards quest, beginning in the early 1990s, for an answer to what caused the supposed mass extinction of land vertebrates at the Permian Triassic boundary (P/T). So, how did Ward, whose primary research during the 1980s was on Late Cretaceous ammonites, become involved in the study of the nonmarine P/T extinction? Quite simply, it was because he needed a large scientific problem to solve. For, as Ward tells us, once he and others established that an asteroid impact caused a sudden end-Cretaceous mass extinction, he went looking for a new and equally challenging scientific problem. Much of the book recounts how Ward met this challenge, with diary-like accounts of his fieldwork in the Karoo basin, mostly in collaboration with Roger Smith and his co-workers at the South African Museum. These accounts stress the hardships and rewards of fieldwork in the Karoo, and reveal many of the ups and downs of the people, their work and the scientific process. I think these accounts are the best part of this book, although fieldwork in the Karoo does not sound much different than working in dry and remote badlands regions, such as those that are common in New Mexico or Wyoming. The rest of this book weaves into the field accounts a progression of discovery and reasoning that should lead us to the cause of the P/T extinction that Ward advocates. However, this part of the book is not well-developed; he reveals little explicit information about evidence of the P/T extinction. The scientific process here is difficult to follow  a difficulty exacerbated by internal inconsistency and questionable scientific reasoning. For most of the book, Ward characterizes the P/T extinction as a sudden and catastrophic event or a message of rapid catastrophe, only to later state that many lines of evidence were converging on something more prolonged than a single quick strike. Wards last word, however, is that the P/T mass extinction leads us to a new view of extinction as fast, and in pulses. Not a single short burst of death ... but instead a series of episodes of extinction, for perhaps a hundred thousand years. How, however, the reader of the previous couple hundred pages, filled with various, inconsistent descriptions, can grasp or in any way evaluate the data behind his conclusion eludes me. Even more problematic is Wards attempt to tie the P/T extinction to a Triassic world of low atmospheric oxygen. Ward claims that Triassic red beds (iron-rich sedimentary rocks) are evidence of (and indeed a cause of) the low oxygen, as the rusting sediments sucked the oxygen out of the air. However, isnt the abundance of Triassic red beds (they are not omnipresent, as Ward believes) evidence of relatively high levels of atmospheric oxygen? Ward concludes that the global rusting caused two enormous catastrophes: the Permian-Triassic extinction followed 50 million years later by the Triassic-Jurassic extinction. Note, however, that Ward later dismisses the end-Triassic extinction as unlike the P/T extinction because it was never a threat to end animal life on the planet. Then, Ward goes a step further with this argument. He uses the supposed low atmospheric oxygen levels of the Triassic to explain the rise of the dinosaurs and their descendants, which followed the demise of the mammal-like reptiles that dominated Permian landscapes. I am proposing that the dinosaurs and their descendants, the true birds, came about as a result of low oxygen, he writes, noting that he is the first to propose such a mechanism. However, the large lungs of birds (and perhaps of dinosaurs) are oxygen-hungry structures designed to supercharge the avian circulatory system by rapidly oxygenating the blood. They are exactly the opposite of what would evolve in a low-oxygen world. Animals that evolve in low-oxygen environments do not evolve structures designed to use large quantities of oxygen. Gorgon is readily recognized as a book of popular science meant to be read primarily by the layperson. I believe such books should present well-reasoned and well-documented science to their readers. This book does not. Gorgon tells us much about what Peter Ward did during the 1990s, but its contribution to a scientific understanding of the end-Permian extinction is a disappointment. Lucas is curator of paleontology and geology at the New Mexico Museum of Natural History. E-mail: Slucas@nmmnh.state.nm.us. In the epic disaster movie The Day After Tomorrow, hurricanes, tornados and hail pummel different parts of the planet. The entire Northern Hemisphere ends up covered with snow and ice. Although the special effects make it look like the real thing, many of the scientific flaws in this enjoyable movie are all too easy to recognize. If you want some suspense when you watch the DVD, to be released this month, read no further  we are about to embark on a little investigation into the science (or lack therereof) behind the film. 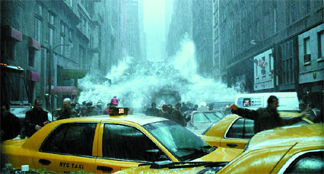 A highly exaggerated storm surge floods New York City in The Day After Tomorrow, a movie that while entertaining, bends several laws of physics in its dramatization of sudden climate change. Image courtesy of 20th Century Fox. The blockbusters opening sequence shows a team of scientists, led by paleoclimatologist Jack Hall (Dennis Quaid), living through an Antarctic ice shelf collapse (in a digitally recreated sequence reminiscent of the disintegrating Larsen B Ice Shelf in 2002). After offscreen analysis of cores from the shattered shelf shows evidence of an abrupt climate change 10,000 years ago, Jack tries to persuade policy-makers that something incredible is about to happen. The movie briefly addresses the trigger for the imminent climate shift, showing Jack standing before a graphic of Wally Broeckers ocean conveyor belt at a United Nations gathering. The release of fresh water at high latitudes from melting glaciers, he says, will lead to a critical desalinization point, slowing down Atlantic circulation, which affects the Gulf Stream  and the weather. What did you think of the movie The Day After Tomorrow? E-mail your reactions, scientific observations and other comments to Geotimes at geotimes@agiweb.org. To prove his point, snow falls on Delhi, massive storms strike Hawaii, football-sized hail kills pedestrians in Tokyo and unbelievable tornados destroy Los Angeles. Jack runs models of a brewing megastorm over the Arctic, showing three conjoined storms  hurricane-looking cloud masses with incredibly cold eyes  traveling south, dumping snow and flash-freezing the planet (and people) as it goes. While the scientists work, the movie follows the somewhat formulaic path of a summer disaster flick, doling out stock characters and tiny glimpses of human drama. One plotline follows Jacks son Sam (Jake Gyllenhall) and his schoolmates, trapped in New York City directly in the path of one of the freezing storm eyes. They witness the inundation of New York, which then freezes solid as the megastorm passes. Jack and his co-workers, well-versed in traveling in Antarctic conditions, set out to find Sam as the climate continues to change ... youll have to watch the movie to find out what happens next. For example, Stokes points out that cores from the Antarctic ice shelves would be too young to contain a climate record of 10,000 years, something normally extracted from Greenland or Vostok ice cores. Also, seasonal Atlantic freezing and thawing would extend the glacial shift over 10 years, not 10 days. And even though the weather teleconnections across the globe are plausible, Stokes says, the movies ensuing flash-freezing megastorm is not. Regardless of the movies trespasses, it does highlight some current geoscience issues. Independent of the movie, there has been modeling of increased inputs of fresh water to the Atlantic, says Tony Busalacchi, director of the Earth System Science Interdisciplinary Center at the University of Maryland, College Park. These water-hosing experiments show an ensuing Gulf Stream deceleration, and heat stops transferring from lower to higher latitudes, changing the way atmospheric moisture moves. We need more work on this, he says, to model abrupt climate change and ocean salinity. More work is also needed in communicating science, says Stokes, who was struck by the movies portrayal of scientists interacting with policy-makers. It was a classic confrontation, he notes, with bullheadedness on both sides, leading characters to discount both valid science and policy concerns. The movie is certainly sensationalistic, Busalacchi says, but it does provide value in getting people to think about the climate. And despite all its faults, scientific and otherwise, the movie was highly entertaining. The larger-than-life imagery of a quickly glaciating planet made it a relief to look outside and find a warm, relatively ice-free planet. When Steven Spielberg's movie Jaws came out in 1975, the shark thriller spawned a generation of people afraid to go in the water. Anthony Leiserowitz, a research scientist at Decision Research, a research institute in Eugene, Ore., wanted to know if the movie The Day After Tomorrow might do something similar for global climate change: Would it change how people perceived the risk of climate change? The team that produced the blockbuster special-effects movie meant to make a "popcorn" flick that also would raise public consciousness of global warming. In a series of national surveys, both before and after the blockbuster movie was released last May, Leiserowitz asked people how they thought about climate change and how they ranked global warming among national policy issues, among other questions. He also tracked media coverage of the movie, from entertainment, political and scientific perspectives. After surveying 529 people, 139 of whom saw the movie, Leiserowitz concluded that movie seemed to have an impact: Statistical differences in opinion on climate change existed between those who had and had not watched the movie. The movie's watchers were more likely than those who hadn't seen it to believe that climate is stable within certain limits, and that in the next 50 years, global warming would bring more intense storms, flooding, food shortages and other impacts. Those polled who saw the movie also answered that they intended to be more politically active on global warming issues or take personal actions on their own. In the end, however, the majority of both watchers and nonwatchers said they were more concerned about global warming, but did not spend much time worrying about it. These survey results will be published in the November issue of the journal Environment. Leiserowitz's report also includes an analysis of media coverage of movies and news events around the same time period, such as Fahrenheit 9/11 and news from Iraq, compared with that of The Day After Tomorrow. Although The Day After Tomorrow seemed to have its intended effect in the United States, Leiserowitz says that his conclusions are tempered by the short time period that the film was in theaters. He intends to follow up on the surveys to see how long the sense of risk imparted by the movie remains with its audience.